How many termite species are there in Australia? Of around three hundred species of termite in Australia, only about twenty are of economic importance in there own regions. 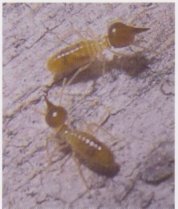 Dampwood termites belong to the family Kalotermitidae. These termites live inside the wood they eat and are rarely encountered in domestic homes. Subterranean termites (families Rhinotermitidae and Termitidae) are much more common in urban areas, usually live in the soil & randomly forage for wood to eat. If termites are a problem for you, then we are your solution! We will rid your home or business these timber destroying pests that are causing you problems. Guaranteed! Builds mounds or arboreal (in trees). All species have Nasute soldiers, head is drawn to a point with fused mandibles. Infests timber & timber in ground contact. Prefers hardwoods. Most destructive of timber in service is Nasutitermes exitiosus. Sub-colonies in buildings often formed from supplementary queens. Identification is from soldier caste with assistance from worker caste, nest habit and region of occurrence. Species of Nasutitermes termites include.